Lanterns: The Right Kind Of Racism? The Right Kind Of Racism? So The New York times has hired themselves a new member of their editorial staff. 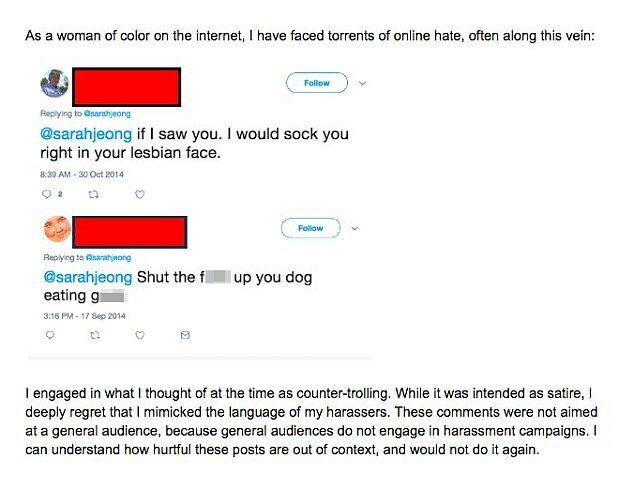 Her name is Sarah Jeong, a writer whos focus is in technology, and she has to say the least set social media ablaze with angry voices condemning her for old tweets that have been made public. What many would consider very racist and disturbing tweets as we can see below. 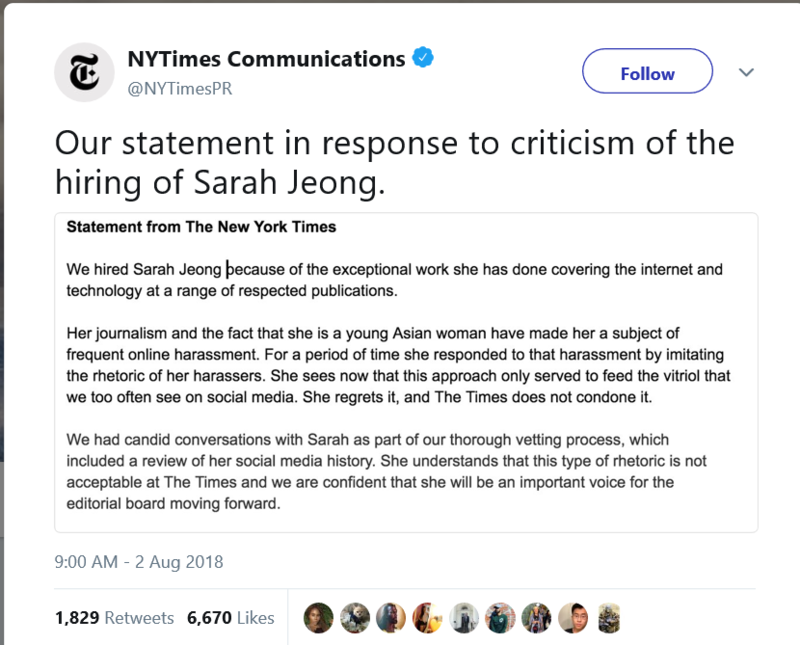 People across the country are voicing their displeasure with the New York Times over hiring what seems to be such a blatantly racist person. They have also not overlooked the hypocrisy by the media giant itself either who has consistently condemned racism at every turn, and yet hires someone who would post such hate filled comments towards white people. This makes the Times' statement regarding the outrage over their new hire seriously puzzling to many people. It goes as follows. OK, so even though the Times does not condone the behavior they basically blame her racist comments on every one BUT her of course. Oh, well that makes everything OK then. Oh and by the way, no one buys the satire BS anymore, too many people have already worn that one out. She was only a racist because other people were harassing her and she was throwing it back at them. She would not have said those things otherwise is the claim? Right! I wonder how that excuse would fly if a white person tried to use it? Where I am from we call that a cop out. You know though to be fair, even though I personally do not believe this for one split second, it is plausible, people get angry, they lash out and say things they may regret later. But these are usually isolated incidents and do not spread out over several years as those by Sarah Jeong do. These are just the ones that we know about so that excuse falls kind of flat there does it not? This defense also falls flat when we introduce an old legal term called "propensity character evidence." This little rule is being used to great effect by the leftists and the MSM against our president, and us, so why would we not apply it towards them as well? The real killer for this defense in my opinion, is when that hatred is spread across multiple targets. It shows a propensity towards hate filled attacks against anyone who disagrees with her view point, or her personally it seems. Then we start asking questions. So, how about the police, were they harassing her for being a young Asian female journalist as well, which prompted her to spew hatred bordering on outright calls for violence against them? Or perhaps it was ALL of the men in the world who were harassing her for being a young Asian female journalist? 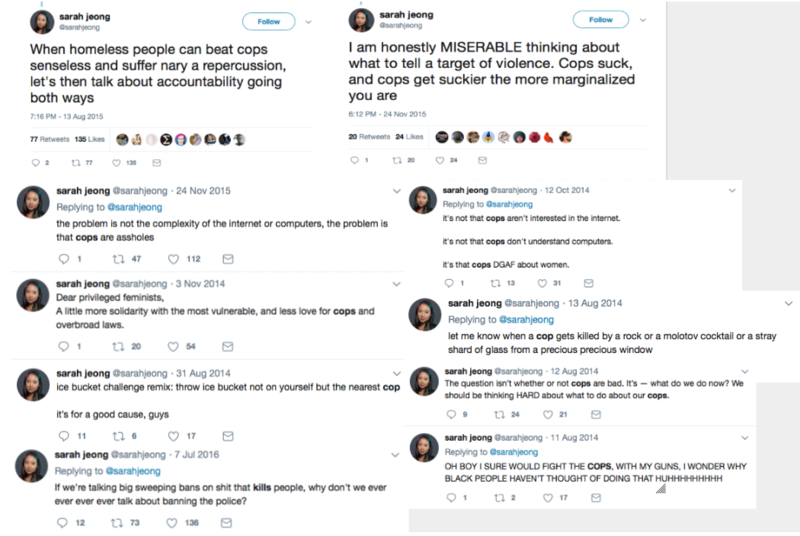 Now I notice that earlier Sarah Jeong says "cops DGAF about women." I wonder if she includes "white women?" Or, maybe it was The New York Times and members of its staff who were harassing her for being a young, female, Asian journalist? She basically calls making fun of the New York Times her favorite way to unwind everyday. Oh, and lets not forget Republicans. These are some forgiving folks over at the New York Times though it seems. And a former colleague comes to her defense from all of the bad actors bringing up her old posts. God forbid we hold any of these people accountable for their actions, that would be outrageous even though of course they are doing the exact same thing. We have come to expect that particular hypocrisy though have we not? "Empathy for EVERYONE around her?" Has this guy even read these tweets? What we have here is a pattern of behavior that reveals itself across a spectrum of targets. Targets that all have the same thing in common, they disagreed with or offended Sarah Jeong in some way. Feeling these things temporarily as a reaction is perfectly normal, acting on them, shows the possibility of a serious issue with impulse control. As we have heard in court room movies "it goes to character your honor", meaning that persons integrity, trustworthiness, and morality. People with impulse control problems are unpredictable to say the least which makes them difficult to trust, its a flaw in their character. These are lines that have in todays world become very blurred though by all of the disinformation and propaganda the media uses to spread their narrative. Thanks to Candace Owens we are able to see the hypocrisy, and double standards of that narrative laid bare for all to see. The lines become very clear. 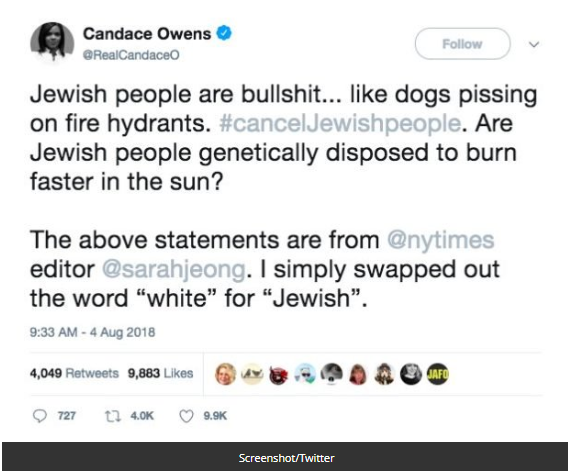 Social media seems very comfortable with the racist tweets Sarah Jeong posted towards white people, so Candace Owens changed the word white with Jewish in a few posts and combined them. When she posted this she was almost instantly banned by Twitter for violating their rules, 12 hours. Now in the end of course the New York Times can hire anyone they choose to, even if that persons favorite pass time was to trash them. I suppose she will need to find a new pass time though. They also had the right to fire another journalist for basically the same exact thing but the public is not stupid, they noticed and they remember. So I guess it was the target that got her fired.. 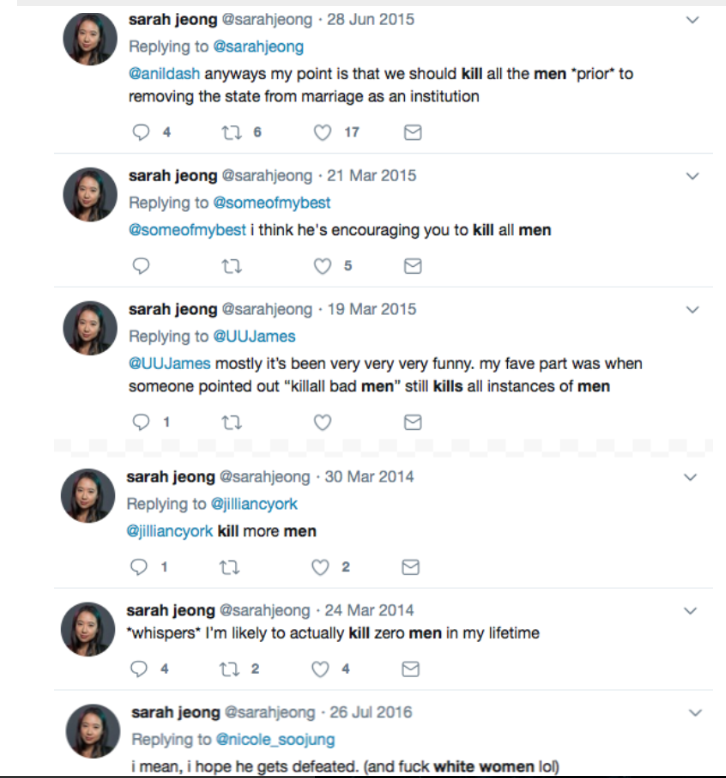 The focus on all of this is not really Sarah Jeong any way, she is just a symptom of a bigger problem. Besides, we judge people based on our own values, and since none of us are mind readers the only person who truly knows what Sarah Jeong thinks, is Sarah Jeong herself. As it is with us all, and we all must carry own burdens. The definition of racism is clear though if left unclouded by emotional attachments, it does not single out any one race or group of races that are exempt from being either the target of, or the perpetrators of racism. In other words, by definition racism can be committed towards anyone if it is based solely on their race. Simple. Its not really about race to begin with though, its about who holds the power, black, white, brown, whoever holds the keys will be seen as the oppressor. Everyone wants to hold the keys because they believe they can do better, they are... superior. Race has nothing to do with it other than being a way to identify ourselves and form tribes so to speak. At its root its simple human nature based on instinct and learned behavior that predates any differences in skin pigmentation we developed through our evolution. Its primal. It has become a powerful tool for manipulating public opinion though, and silencing opposing viewpoints, especially within the cyber reality of todays social media where a simple click ends a conversation. But those of us who think for ourselves begin to ask questions. Are we seeing a shift in that reality and what is considered acceptable and unacceptable when it comes to racism? Is racism itself being redefined to weaponize it against one specific race of people? 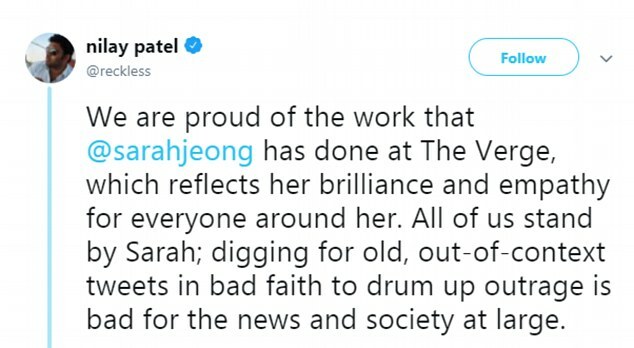 Where are we as a society when Sarah Jeong can say such racist things towards white people, and not only keep her job but be praised in the media as well? But if we change that one word, white, to any other color or ethnicity etc. the whole comment becomes instantly evil, it must be banned, why? Would that certainly not be considered selective outrage which at its core is nothing more than open bias? And then the biggest question of all. Does this mean that we as a society are once again riding that slippery slope right into a reality to where racism is considered not only perfectly fine, but its usage encouraged? As long as it is "THE RIGHT KIND OF RACISM" of course. Because this all sounds frighteningly familiar does it not? Oh that's right, it is the exact same tactic Hitler and his propagandists used to turn the German population against the Jews, we all know how that turned out. And they call US the fascists. I seek the truth, no matter where it may lead me. Deep Fakes... The Next Evolution In Propaganda?